Most bacteria divide by placing a protein called FtsZ at the division site. Traditionally, it was thought that FtsZ must organize into a ring in order to recruit a dozen of other proteins and together with them exert an homogeneous and simultaneous constricting force pinching the bacterium from side to side. Just as when one tries to squeeze a rod-shaped air-balloon with a thumb and a ring finger. Although it is still debated which one – among the division complex proteins – is generating the constricting force, it has never been debated that FtsZ forms a ring. Be it made by continuous FtsZ filaments or by short and partly overlapping ones, be it patchy, elliptic or toroid, a ring has been long believed to be sine qua non for cell division. Bacterial cell biology textbooks have been written by studying microorganisms that can be grown in the laboratory. However, most microbes are not cultivable yet and can only be observed in their natural environment. This is the case of microbes engaging in intimate associations with multicellular organisms. Silvia Bulgheresi and her team study the bacteria that grow and reproduce on the surface of a small family of marine nematodes, the Stilbonematinae. It is on those occurring around a tropical island in the middle of the Caribbean that the unconventional microbe was discovered. The analysis of this bacterium, the symbiont of the marine nematode Robbea hypermnestra reinvigorates the discussion about how the constrictive force that drives bacterial cell division is generated. 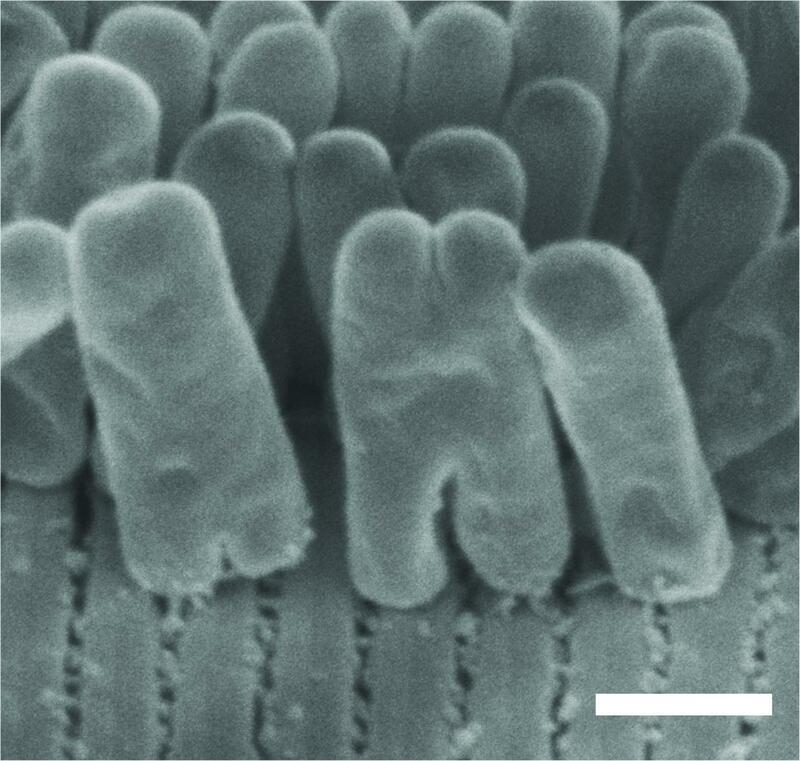 The symbiont is a roughly 1 x 3 μm rod-shaped bacterium attached with one pole to the surface of its nematode host. First weird thing it does, is to orient its division plane parallel to its long axis, which makes it divide longitudinally instead of transversally (like conventional rod-shaped bacteria do). But as if building a wall and pinching a membrane over an approximately three times longer distance were not challenging enough, this resourceful organism tops it up by dividing asynchronously. Namely: it first invaginates at the nematode-attached pole and then at its free pole. "But the biggest surprise came as we searched for the FtsZ ring and we found none" explains Nikolaus Leisch, first author of the paper and currently a Postdoc at the Max Plank Institute, Bremen. The division of the R. hypermnestra symbiont leaves the dazzled scientists at a loss to know which kind of evolutionary advantage this quirky division might bring. One possible explanation is that this would allow the symbiont to remain faithful to its worm host. "Longitudinal division might have evolved to transmit host attachment to both daughter cells. In other words, to avoid that one daughter cell is lost to the sand or the sea", speculates Bulgheresi.